DC Moore Gallery is pleased to present an exhibition of new work by Mark Innerst, which will be on view from April 24 to May 31, 2014. A catalogue with an essay by Edward Burns will be available. 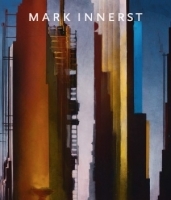 Mark Innerst is a painter who transforms the urban and rural landscape, investing it with a radiant beauty and complexity. Cities like New York and Philadelphia can simultaneously appear majestic, immense, and serene, as streetscapes become a series of soaring verticals or stacked, layered blocks of color. Buildings curve overhead or sweep downward to street level, where human activity is reduced to blurs of light and movement. In his new Midtown series, inspired in large part by the towers that line Manhattan’s Sixth Avenue in the forties and fifties, as well as in his paintings of downtown Philadelphia, Innerst reduces architecture to abstracted elements, stripes and geometric shapes, that recede in rhythmic progressions to either an opening at the end of an urban canyon or the façade of another building, closing the view in upon itself. Innerst also paints panoramic vistas of rivers and estuaries, atmospheric landscapes intersected by prismatic hues that create bold visual effects. By emphasizing the refraction of light in these luminous environments, some of which include industrial buildings on a low horizon in the distance, he invites us to reflect on the interplay between an idealized landscape and the modern world. From his exacting use of glazes to his handmade frames, Innerst adapts tradition to his contemporary intentions. In his new work, he continues to draw upon the great tradition of nineteenth century European and American painting and the structural and expressive use of color as explored in mid-twentieth-century abstraction, as Edward Burns notes in his catalogue essay. His paintings are vibrant and inventive, anchored in his immediate environment, while at the same time, transcending everyday perception with a dynamic vision of the modern world. Mark Innerst lives and works in Philadelphia, PA, and Cape May, NJ. After graduating from Kutztown State College in Pennsylvania in 1980, he moved to New York City, where he began to pursue his career. Since then, he has exhibited widely and has had one-person shows at Gallery Alain Noirhomme in Brussels, Belgium; and Emilio Mazzoli Galleria d’Arte Contemporanea in Modena, Italy; as well as at the Contemporary Arts Museum, Houston; Nelson-Atkins Museum of Art, Kansas City; and Museum of Contemporary Art, Chicago. His work is in the permanent collections of the Museum of Modern Art, Metropolitan Museum of Art, Solomon R. Guggenheim Museum, Brooklyn Museum, and Albright-Knox Art Gallery, among others. Huffington Post: "Q&A with Mark Innerst"